Here is the sorry state of a beloved vintage granny stripe blanket. It’s been with me for almost 20 years and is a favorite to snuggle up on the couch with. The kids also drag it around and take it to bed, so it’s sadly needed a few heavy washings. Yay! for acrylic on that one, but it’s taken a beating. This granny stripe afghan has started to unravel from the bottom up. I should have intervened right there and fixed it or at least put it in the to fix pile, which grows every day it seems. But instead it stayed in use, and of course, kept unraveling. Now two rows are starting to come apart, presenting the complicated challenge of needing to stitch into and through the row above. So I set out to try to repair the crochet stitches. This repair was a lot of trial and error. Follow along with me if you like and keep in mind if ever you need to fix your granny square or granny stripe blanket. First, I unraveled the lose stitches on the bottom row and joined the broken yarn. I used a magic knot join as I just did not have enough yarn to do a Russian join. I was able to hide the knot. Right from the start let me say, if you have the same yarn or very similar, just use new yarn and don’t try to spare what you have in the blanket. Some of the yarn was frayed so badly, I needed to remove a section and I didn’t have enough yarn. To compensate, I went down a hook and made the last cluster have only 2 stitches. I could have started the whole project one hook size down from recommended, but I figured that out at the end! Next, I crocheted 3 dc in each space across to recreate the clusters. 3 Slip Stitches up the side to connect it to the border and travel up to the next row. Now I need to start working in the row above, a little tricky. Enter the yarn needle to save the day! I threaded the working yarn through the needle and went through the chain stitch in the border of the row above the row I would be repairing and then turned the work. I needed to make a working loop so I went through the same stitch I just threaded through again. Then I made my first cluster in the first space in the row below. Have loop, will travel! Next I threaded the loop through the dc cluster stitches in the row above and then threaded the working yarn through after. You can also use your crochet hook to grab your working loop and pull it through. This might go a little faster. From there it was just rinse and repeat and connecting the working yarn where it broke off. I had to redo it a few times due to running out of yarn and ended up using a smaller hook (US H) to get a tighter tension, ending up with only enough for a a cluster of 2 dc at the end instead. So here it is, my fixed granny stripe blanket! I am seeing some things I will do different for next time, but in the grand scheme of a full size blanket, it works. Remember to wash those vintage goodies on delicate or by hand. Have you ever attempted a crochet or knit repair? I’d love to hear in the comments how it went. The Ultimate Deal on Blocking Mats – 24 Inches Square! I’ve been crocheting for 58 years (started at age 7 & taught by my two grandmothers.) 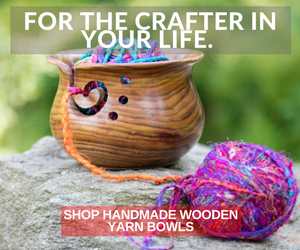 I’ve always loved teaching other’s to knit and crochet, so I took advanced techniques class, first crochet, then for knit a year later, through the Craft Yarn Council of America. I became a licensed, certified instructor for both crafts, and have taught in craft stores like Michaels & JoAnns. My friend that owned a yarn shop asked if I could repair a very large, damaged, antique heirloom tablecloth, over a 100 years old. The woman who owned it had washed it in a “Washing Machine” & all the centers of the pieced motifs had broken from the extreme weight of the tablecloth, once wet. The centers had been done incorrectly, with a VERY weak, flimsy, beginning, with only a single strand of thread, instead of a chain. It was VERY tricky to make new starting centers with loops hanging free from the 2nd round. It wasn’t so much the task at hand, but the extreme number of them! After I spent weeks repairing the centers, I cleaned the tablecloth on my dining room table, not in a washing machine! I cleaned all the spots and the rest of it, being braced on my table. It was all worth the effort though. The owner of the tablecloth was so distraught from thinking she had ruined her husbands grandmother’s family heirloom tablecloth, and felt if was a lost cause. She paid me $500 for repairing & restoring it to just like new. I was shocked! What a story Tammy, wow! What a fabulous skill set you have. I’m sure it was worth every penny to have her heirloom repaired. I would love to learn more about cleaning. I’m guessing you handwashed it in a small container or bucket? Thanks so much for sharing! Sakeenah this came out awesome! It really looks like new again! It really would have taken me months of that blanket being in the fix pile before I wrapped my mind around it. Did you make this blanket yourself or was it given to your family as a gift?